At this time of the year, many families are returning to their back-to-school routines. You might want to take the change in schedule as an opportunity to improve your child’s sleep habits. Quality sleep is extremely important for children’s health, and it affects their ability to focus on tasks during the day. Though the requirement varies with their age, kids need at least 9 hours of sleep each night to be healthy, active, and perform their best in school. Here are some tips to help achieve restful sleep – good for kids and adults alike! The best way to make sure kids get enough sleep is to stick to a regular bedtime. If homework and extracurricular activities are reserved for the early evening, your child has the opportunity to unwind later on. Routine and relaxing activities before bed, like taking a bath or reading with your child, can help kids transition into sleep mode. A peaceful, darkened environment is most conducive to sleep. Instead of letting your child fall asleep in front of the TV, opt for a nightlight or soft music, and close the curtains or blinds. Most people have trouble sleeping in a room that’s too hot or too cold, so make sure your child is comfortable. A slightly cooler temperature at night is optimal for sleeping, but leave an extra blanket just in case. Today’s kids are digitally connected to smart phones, tablets, laptops, games and more. But using them too close to bedtime makes it harder to unwind. The mental stimulation deters sleep, and the kind of light they emit can disrupt circadian rhythms – the body’s internal clock that determines when you’re awake and asleep. 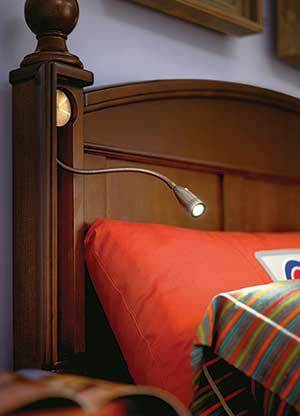 A book and a bedside lamp are a more restful choice. Size A twin mattress is common for younger children, but older kids may prefer a full or queen. Also consider whether your kids share a room or a bed. Mattress types Just as with adult beds, kids’ mattresses come in all support types – innerspring coil, memory foam, latex – in various levels of firmness. Do a little research to determine what fits your budget, your preference, and be sure to have your child test them in the store. Durability The mattress will likely be jumped on, spilled on, and otherwise take a beating. The more durable the mattress, the longer it will last. Also, grab a mattress cover to help prolong its life by protecting it from spills and stains. Allergies If your child has allergies or asthma, he or she will benefit from dust mite- and allergen-resistant materials. Latex foam mattresses are hypoallergenic and naturally antimicrobial. If a latex mattress is out of your price range, any mattress can be fitted with a hypoallergenic mattress cover. Your allergist may recommend a zippered full mattress encasement to limit dust mite reactions.